Hyundai plans to offer an Apple Watch app for its Blue Link service shortly after the watch goes on sale next month. SAN FRANCISCO -- BMW AG designed the futuristic i3 city car, with its electric powertrain and carbon-fiber body shell, as a car for high-tech trendsetters. Naturally, the i3 will be the first car paired with the new Apple Watch. In the months leading up to the March debut of the Apple Watch, engineers from BMW's r&d center in Palo Alto, Calif., worked with Apple engineers to retool an iPhone app for the new wrist computer. Dave Buchko, a BMW spokesman, said the updated app, called i Remote, will be ready for download when the Apple Watch arrives in stores on April 24. "The wearables concept is really catching on. With the brand force that Apple has behind it, the smartwatch industry can only grow from here." 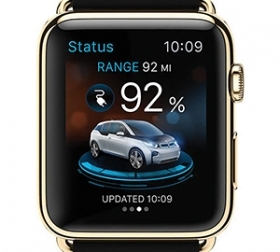 BMW retooled an iPhone app for the i3 to work with the Apple Watch. Smartwatches are in their early days, but automakers see the rollout of the Apple Watch as a seminal moment. If any company has the clout to make smartwatches desirable to the masses, clearing the way for automakers to pitch new connected-car features, they say, it is the company that invented the iPod and iPhone. "The wearables concept is really catching on," Cason Grover, a technology planning manager at Hyundai Motor America, said in an interview. "With the brand force that Apple has behind it," he added, "the smartwatch industry can only grow from here." By tapping on a wrist-mounted Apple Watch, owners of the i3 will be able to check the remaining charge in the electric car's batteries, lock and unlock its doors or follow turn-by-turn directions to their parked car. Hyundai is close behind. It plans to offer a similar app for its Blue Link service shortly after the Apple Watch goes on sale. The Apple Watch, priced from $349 for a basic version to more than $10,000 for a watch made with 18-karat gold, is hardly the first product of its kind. Apple's archrival Google Inc. has adapted its Android operating system for smartwatches; LG, Motorola and Samsung all have Android watches on sale. Some cars are already compatible with these gadgets. BMW's i Remote app has been available since January for Android smartwatches, and Hyun-dai has offered its app for Android smartwatches since early March. Yet these devices are niche products, worn mainly by early adopters who enjoy testing technology before it goes mainstream. Consumer electronics analysts routinely compare today's smartwatches to digital music players before the launch of the iPod in 2001, or to smartphones before the debut of the iPhone in 2007. Apple is betting it can make the Apple Watch feel indispensable, not gimmicky. But even if it succeeds, linking a smartwatch to a car may not feel essential. Android and Apple smartwatches are paired to smartphones, rather than using their own cellular connection, so it is not entirely clear what a smartwatch can do that an iPhone cannot. "Although a watch is more available as it's always on your wrist, people always have their phones in their pockets or purses anyway," said Andy Gryc, a former automotive manager at QNX who is now a private consultant. Grover, who has tested an Android smartwatch for the past year, said he sees benefits from pairing it with a car. 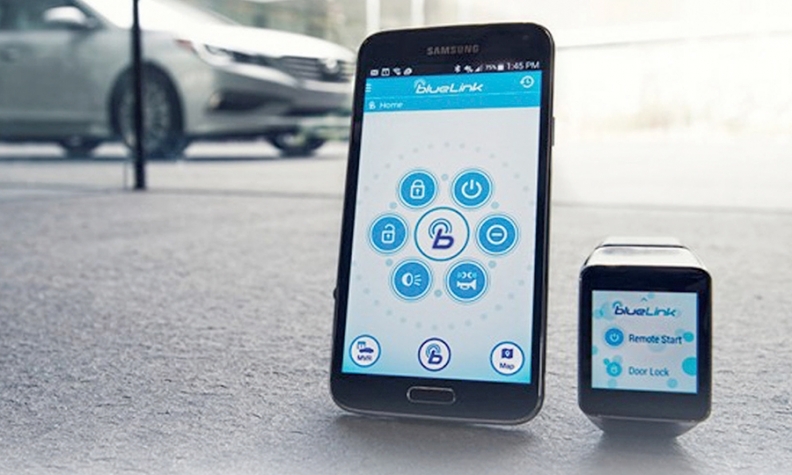 Having a wrist-mounted computer spares consumers the trouble of pulling out their cellphones to use Hyundai's Blue Link service if they want to warm up the car or start the air conditioner. "It's going to start as a little bit of a luxury -- something that the more tech-oriented people will be drawn to," Grover said. "Over time, that may start to change."